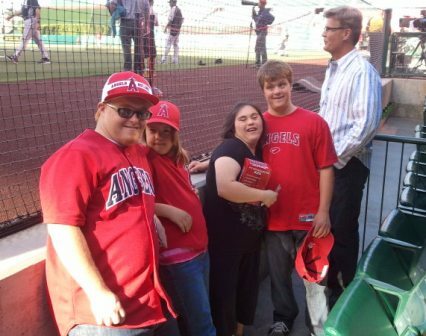 After meeting with the Pujols Family Foundation earlier this week, DSAOC was presented an exciting opportunity to attend Wednesday night’s Angels vs. White Sox game with Todd Perry, the CEO of the Pujols Family Foundation. Mr. Perry’s hospitality certainly started things off with a bang, as he led our group to a beautiful suite donated for the evening by Mark Merhab from the Angels Baseball Foundation. Just when we thought the night couldn’t get any better, Mr. Perry scheduled our families for a surprise visit with Albert Pujols. I have one word for you…. AMAZING!!!! Albert met with all of us before the game and was as nice as you can get. He took the time to shake everyone’s hand, sign autographs and take pictures with our teens and adults with Down syndrome. Albert truly is an Angel. 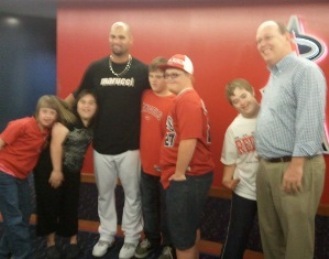 Check out the rest of this amazing night by visiting the Pujols Family Foundation Facebook page. If your child with Down syndrome is between the ages of 4-17 years, they have an opportunity to participate in this exciting and informative study. 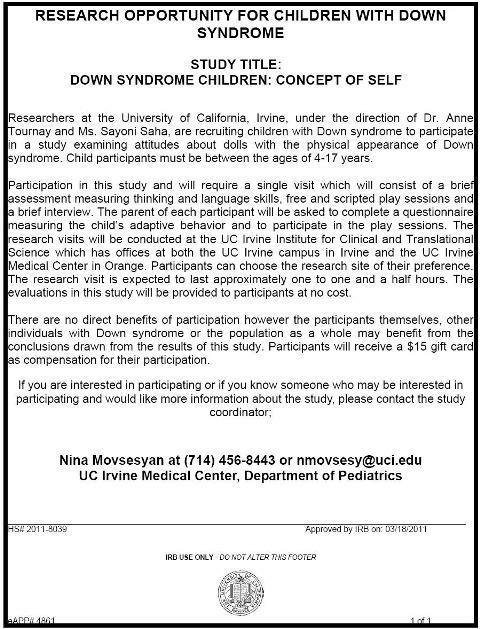 As many of you are already aware, researchers from the Down Syndrome Program at CHOC Children’s/UC Irvine have been conducting a study on self-concept in children and young adults with Down syndrome. The research team is still seeking volunteers for this study and are scheduling final study visits for May and June. Please see the information below on our blog posting for a brief description of the study. If you have an interest in participating, or if you have questions, please contact Eric Doran at (714) 456-8443 or edoran@uci.edu. Register today for the DSAOC Banquet & Auction! This is a FUN way to support DSAOC! Please join us. Want to see how much FUN you could have…? Watch the 2011 Video. Purchase your tickets today for the DSAOC Banquet & Auction, immediately following our Eighth Annual Golf Tournament on Monday, June 11 at Los Coyotes Country Club. The Banquet & Auction is from 4:30-7:30 p.m.
Light Hors d’oeuvres and cash bar on the terrace from 4:30-5:30 p.m. Opportunity to witness our Helicopter Ball Drop at 5:30 p.m.
Register online, download the form, or call the DSAOC Center at (714) 540-5794. Bringing the kids to the Banquet? Kids meal tickets are available for $20 each. Call the Center at (714) 540-5794 to reserve. PURCHASE HELICOPTER BALL DROP Tickets! 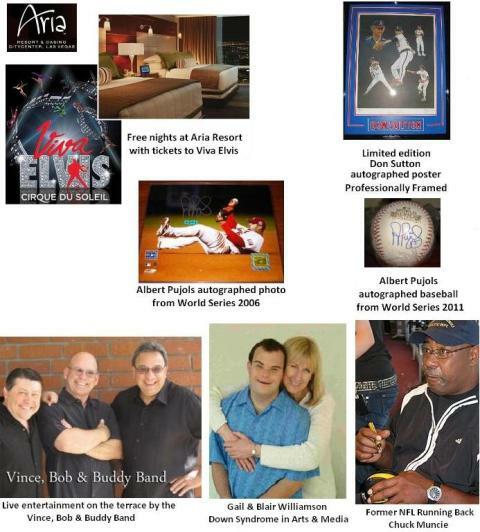 Here’s a sneak peek at some of our special guests and auction items! 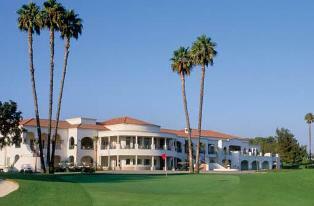 Posted in Uncategorized | Comments Off on Register today for the DSAOC Banquet & Auction! This is a GREAT story from a dad’s perspective about his son. 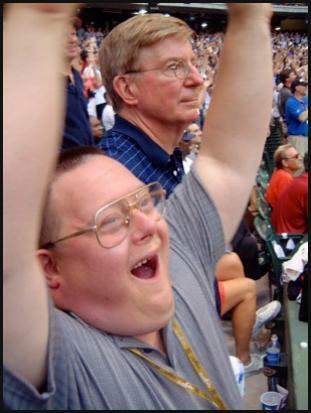 Jon Will is showing the world that he is living well with Down syndrome. George F. Will talks about “Jon’s Gift”. The Pujols Family Foundation has announced that it is expanding its support to Kansas City, Nashville, Tenn., and Southern California.